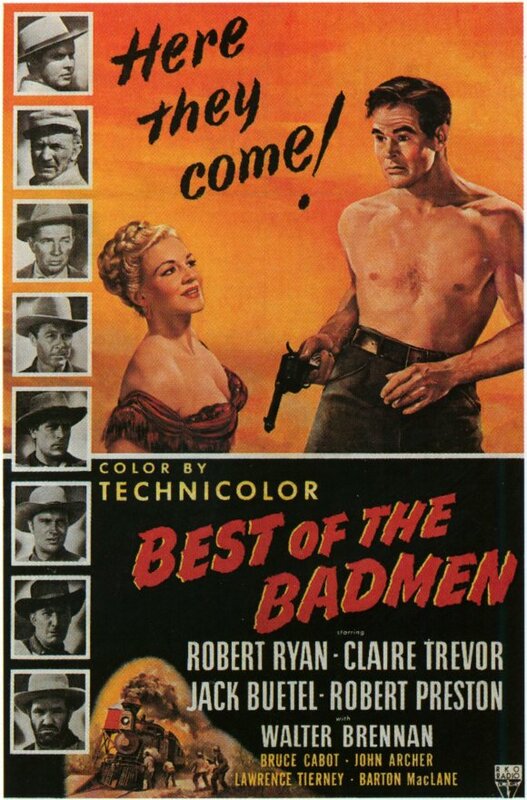 BEST OF THE BADMEN strew bull-puckey across the concept of truth-in-advertising in 1951 by fictionalizing the dagnappit out of the James-Younger crew, and director William D. Russell does guldurn little in 84 minutes to show us why Robert Ryan, Claire Trevor, Robert Preston, Walter Brennan and several hardy chums thought this would be worth signing up for. Some ridin’, some jawin’, some shootin’—time to go mow the lawn. Ryan, 42, had a busy year, with Flying Leathernecks, The Racket and On Dangerous Ground, all better than this. Preston, 33, also had three more seekworthy films the same year—Cloudburst, My Outlaw Brother and When I Grow Up. Ms. Trevor was staying busy, still warm after her Oscar win three years earlier in Key Largo. Brennan, ‘old’ at 57, never stopped in a career that listed 244 credits. Grosses of $3,000,000 put it in spot #122 for the year. With Jack Buetel, John Archer, Bruce Cabot, Barton MacLane, Lawrence Tierney and Robert J. Wilke, all pros to no avail. Filmed in Utah, because California didn’t look enough like Missouri. Rock stars put socks in their pants, so whats the problem?